Mr Hunt said EU countries would like for "Europe to become one country" like the US but Britain has wanted to remain "totally independent". The Foreign Secretary says there is ‘wind in the sails’ of the opponents of Brexit and MPs cannot ‘wish away the parliamentary arithmetic’. Jeremy Hunt has become the first senior Western politician to visit Yemen since the country collapsed into a vicious civil war. Venezuela's government has rejected demands by European nations that it quickly call new presidential elections. 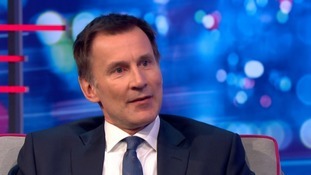 Jeremy Hunt has warned Iran against using innocent dual-national Britons as political prisoners as he prepared to visit the country. Jeremy Hunt is to announce the UK will hire business leaders instead of civil servants as ambassadors after Brexit. The key EU figure suggested the Tory conference had served as a distraction to the Brexit negotiations.